Tsuji and Nakamura have prepared the tri-p­-quinodimethane 1.1 Quinodimethanes are of interest because of their possible diradical character. This new example is most interesting. It is stable as a solid in air and ambient light for 6 months, or 2 months in solution. Its ESR shows fine structure, with a spin-spin distance estimated to be 14.6 Å, very close to the distance between the terminal carbons. The ground state is a singlet, with the triplet lying 2.12 kcal mol-1 higher in energy. UB3LYP/6-31G** computations (lacking the aryl and phenyl sidechains) indicate a ground state singlet (with sizable spin contamination) and a gap to the triplet of 1.83 kcal mol-1. The computed geometry is shown in Figure 1. Figure 1. UB3LYP/6-31G** optimized geometry of 1. The analog having just two quinodimethane units showed no ESR signal and the computed singlet-triplet energy gap is 5.68 kcal mol-1. It would have been interesting to have computed the NICS values for the 6-member rings – as a measure of aromatic vs. non aromatic character to further support the participation of the biradical resonance structure contribution to 1. Lodewyk and Tantillo3 examined seven diastereomers of 1, all of which have a cis fusion between the saturated 5 and six-member rings (rings C and D). Low energy conformations were computed for each of these diasteromers at B3LYP/6-31+G(d,p). NMR shielding constants were then computed in solvent (using a continuum approach) at mPW1PW91/6-311+G(2d,p). A Boltzmann weighting of the shielding contants was then computed, and these shifts were then scaled as described by Jain, Bally and Rablen4 (discussed in this post). The computed NMR shifts for 1 were compared with the experimental values, and the mean deviations for the 13C and 1H svalues is 1.2 and 0.13 ppm, respectively. (The largest outlier is 3.4 ppm for 13C and 0.31 for 1H shifts.) Comparison was then made between the computed shifts of the seven diasteomers and the reported spectrum of Nobilisitine A, and the lowest mean deviations (1.4 ppm for 13C and 0.21 ppm for 1H) is for structure 2. However, the agreement is not substantially better than for a couple of the other diasteomers. They next employed the DP4 analysis developed by Smith and Goodman5 for just such a situation – where you have an experimental spectrum and a number of potential diastereomeric structures. (See this post for a discussion of the DP4 method. )The DP4 analysis suggests that 2 is the correct structure with a probability of 99.8%. Banwell has now synthesized the compound with structure 2 and its NMR matches that of the original natural product.6 Thus Nobilisitine A has the structure 2. (1) Evidente, A.; Abou-Donia, A. H.; Darwish, F. A.; Amer, M. E.; Kassem, F. F.; Hammoda, H. A. m.; Motta, A., "Nobilisitine A and B, two masanane-type alkaloids from Clivia nobilis," Phytochemistry, 1999, 51, 1151-1155, DOI: 10.1016/S0031-9422(98)00714-6. (4) Jain, R.; Bally, T.; Rablen, P. R., "Calculating Accurate Proton Chemical Shifts of Organic Molecules with Density Functional Methods and Modest Basis Sets," J. Org. Chem., 2009, DOI: 10.1021/jo900482q. In a follow-up to their experimental study that found that cyclobutenone is an excellent dienophile (and which I blogged about here), Danishefsky teams up with Houk and provides an insight into the reactivity.1 In the Diels-Alder reaction of cyclopentadiene with 2-cyclohexenone, 2-cyclopentenone and cyclobutenone, the product yield increases in the order 36%, 50% and 77%. M06-2x activation enthalpies decrease in this series 15.0, 13.3 and 10.5 kcal mol-1. While these activation energies do not correlate with reaction energies, the activation energies do correlate nicely with the distortion energy. (Distortion energy is the energy required to distort reactants to their geometries in the transition state, but without their interaction.) Houk and Danishefsky argue that it is much easier to distort cyclobutenone to its geometry in the TS (and this distortion is primarily moving the alkenyl hydrogens out of plane, away from the incoming diene) than for the larger rings. This is due to (a) the larger s-character of the C-H bond in the smaller ring and (b) the C-C-C angle in the smaller ring is closer to the angle in the pyramidalized TS structure. Novel aromatic (or at least potentially aromatic species) just keep on coming! Tobe has prepared this interesting ortho-quinodimethane derivative 1b.1 Ortho-quinodimethane derivatives are rare, due to the high reactivity of the underlying structure 2. Known derivatives of 2 tend to undergo an electrocyclic rearrangement to the cyclobutanobenzene 3. Fusing the benzene rings should minimize this electrocyclization, and the mesityl substituents should minimize dimerization. In fact 1b is stable as a solid or in solution, even in solution exposed to air. B3LYP/6-31G(d) computations are in nice agreement with the x-ray structure concerning the important C-C distances. The terminal rings have delocalized bonds, while the interior three rings exhibit bond alternation. The authors claim that 1 should be thought of as ortho-quinodimethane bridged by two benzene rings. There does seem to be a bit of diradical character, though temperature dependent NMR shows no broadening, so the singlet-triplet gap is large, and therefore 1 exhibits small diradical character. The computed NICS(0) for 1a values are -3.94 for the terminal ring (indicative of an aromatic phenyl), +9.20 for the 5-member ring, and +5.42 for the middle ring. These can be compared to the NICS(0) value of +3.21 for the ring of 2 and +11.51 and +21.17 for the 6 and 5-member rings of 4, respectively. So, 1a expresses some antiaromatic character. Compounds with long C-C bonds have typically been designed by placing large, sterically bulky groups attached to the two carbons. Not only does this lead to a longer bond (like the 1.67 Å C-C bond in 1) but these bulky groups also weaken the bond. This leads to molecules that tend to be difficult to isolate. Schreiner has taken an alternative approach: design a sterically crowded molecules that is stabilized by dispersive forces between the large groups!1 The dimer formed from diamantane 2 was prepared and isolated. The C-C distance is quite long: 1.647 Å. 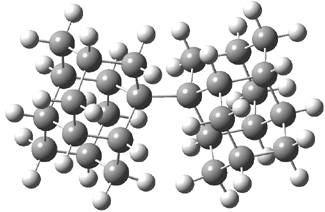 The compound is stable up to at least 300 ° C.
Computations of 2 were performed with a variety of density functional, all of which predict a long C-C bond. The bond dissociation energy of 2 is predicted to be 43.9 kcal mol-1 at B3LYP/6-31G(d,p), a value consistent with the long CC bond. However, B3LYP does not account for dispersion. The H…H distances between the two diamantyl groups range from 1.94 – 2.28 Å, suggesting that there could be appreciable dispersion stabilization. In fact, computing the BDE with B3LYP+D (Grimme’s dispersion correction) or B97D or M06-2x (all of which account for dispersion to some extent), predicts a much stronger bond, with the BDE ranging from 65-71 kcal mol-1! Here is a stable molecule with a stroing, yet long C-C bond – where a good deal of the strength results not form the interaction between the two atoms of the formal bond, but rather from the energy associated form interactions across the entire molecule. This is a true delocalization effect! Figure 1. B3LYP-D/6-31G(d,p) optimized structure of 2. (1) Schreiner, P. R.; Chernish, L. V.; Gunchenko, P. A.; Tikhonchuk, E. Y.; Hausmann, H.; Serafin, M.; Schlecht, S.; Dahl, J. E. P.; Carlson, R. M. K.; Fokin, A. A., "Overcoming lability of extremely long alkane carbon-carbon bonds through dispersion forces," Nature, 2011, 477, 308-311, DOI: 10.1038/nature10367.